Arthur Cayley (1821–1895) was a key figure in the creation of modern algebra. He studied mathematics at Cambridge and published three papers while still an undergraduate. He then qualified as a lawyer and published about 250 mathematical papers during his fourteen years at the Bar. In 1863 he took a significant salary cut to become the first Sadleirian Professor of Pure Mathematics at Cambridge, where he continued to publish at a phenomenal rate on nearly every aspect of the subject, his most important work being in matrices, geometry and abstract groups. In 1883 he became president of the British Association for the Advancement of Science. 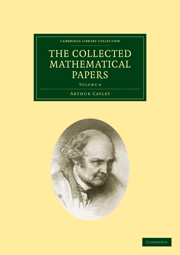 Publication of his Collected Papers - 967 papers in 13 volumes plus an index volume - began in 1889 and was completed after his death under the editorship of his successor in the Sadleirian Chair. This volume contains 89 papers mostly published between 1883 and 1889.